While cleaning out the garage one day I came across a box that I’d forgotten I had. Inside were old photos and several other interesting items that I would like to share with You. My name is Hendrikus Wihelmus Puts and I was born on the 11th of March 1931 and lived with my family at 37 Graafsedwarsstraat, Nijmegen. Geraldine and I went the kinder garden that was run by the Catholic Sisters located in De Ruyterstraat, and then to St. Joseph’s Primary School found in Schoolstraat. It was a very old school. I also completed two and a half years of trade school (Ambachtsschool) to learn Painting and Decorating and so I chose to follow in the footsteps of my father Arnold Puts who was also a painter. In the early morning of the 10th of May 1940 the Netherlands was invaded by the German Army and I was woken up at the sound of a terrible bang. 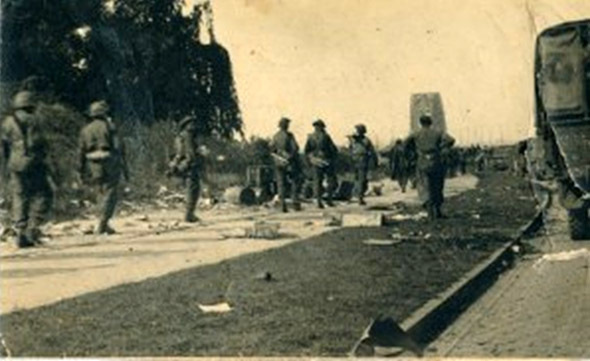 To slow the German advance the Dutch Engineering Corp had blown up two nearby bridges where the Graafseweg crossed over the railway line just south of Nijmegen railway station. Here the railway divided and these two bridges were just around the corner from our home; about one kilometer away and the force of the explosion blew out all the glass in our windows. They also at this time destroyed the River Waal Bridge and I think the Maas-Waal canal bridge. After such a dramatic start the first two and a half years of the war became relatively quiet but as the war went on things got worse. By 1942 you were not allowed to listen to the radio any more and you were especially forbidden to listen to the B.B.C. This was most unfortunate because back in 1938 my father had bought a new wireless radio made by Telefunken which had an ‘automatic eye’ which was a very innovative thing at that time. The only stations you could tune into were Hilversum 1 and 2 and you could only receive German propaganda, so there went our Telefunken. 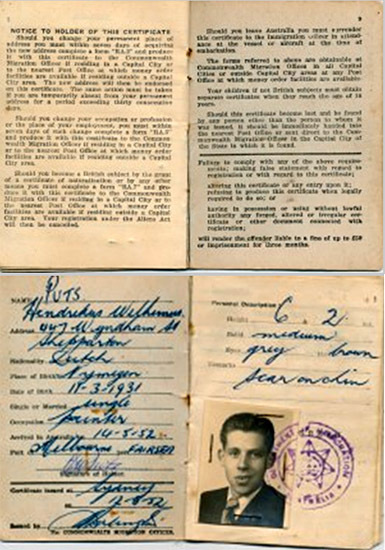 Every person upon reaching the age of 16 years was issued with an identity card and they also began to issue food coupons. If you had no identity card, you received no food coupons and so you went hungry. Around this time young Dutch men were also being sent to Germany to work as labourers in their factories and fields, the so called Arbeitseinsatz (forced labour deployment) thus allowing more German men to be called up for military service. At first the German authorities tried ‘voluntary’ methods of persuasion but they soon resorted to using force which became a type of slave labour. 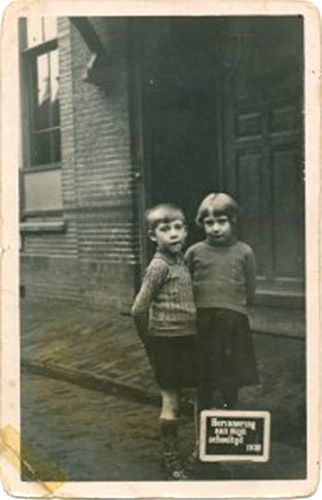 At that time of the war we had a family living in our street by the name of Wagenmans. They were Volksdeutsch. The Volksdeutsch were people from German decent, sharing language and culture with Germany but who lived beyond the German borders. 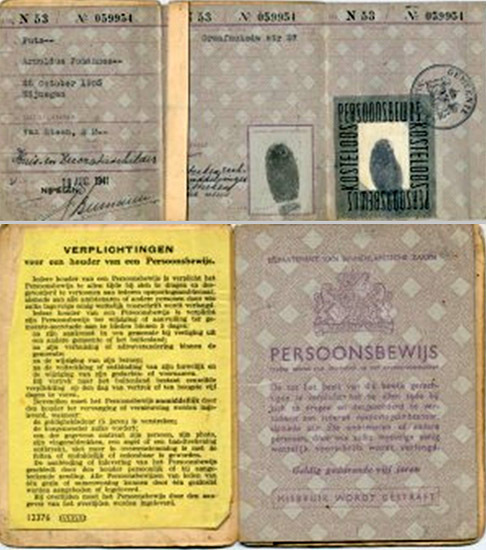 These people were forcibly deported from the Netherlands after the war. This particular family if I recall correctly had four sons and one daughter. 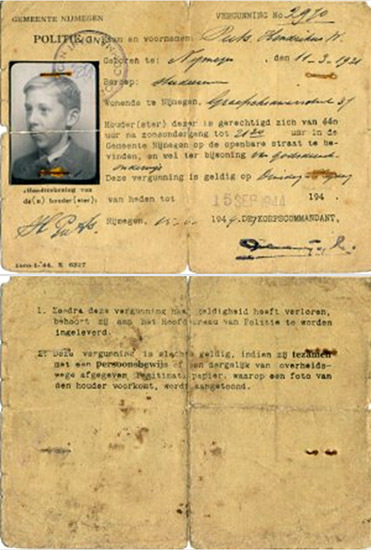 Antoon Wagenmans was an SS guard at the Amersfoot Concentration Camp. 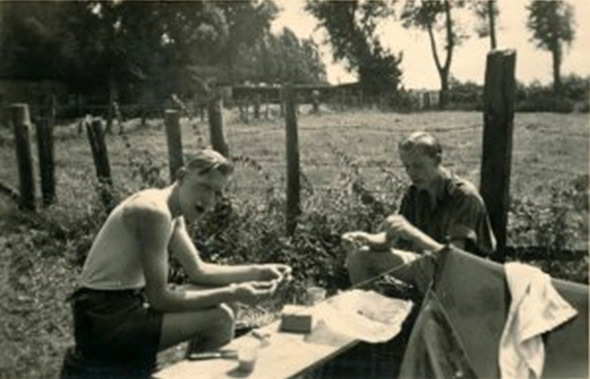 Chris Wagenmans was in the Wafen SS and was sent to the Russian front. Gerard Wagenmans was in the SA and Mathew the youngest was in the Hitler Youth. Because of the Arbeitseinsatz two of my uncles finished up in concentration camps. Uncle Wim Vrolijks spent two years in Buchenwald but I’m not sure where my other uncle Gerard Puts went because when he tried to avoid being sent to work in Germany he was caught and became a political prisoner. Those who wanted to avoid the Arbeitseinsatz became known as onderduiker. My father (who also became an onderduiker) was extremely lucky never to be caught but as a result of him moving around a lot to avoid detection I didn’t get to see that much of him during the early part of the German occupation. I can also remember one day my classmates and I were walking to the public swimming pool and we were singing a Dutch national song, “Piet Hein, Piet Hein, zijn naam was klijn”. We were stopped by two German soldiers. They spoke to our teacher and told us we were not allowed to sing this song any more, but in a small act of defiance two boys kept a lookout and when the soldiers were far enough away they let us know when it was safe to start singing again. 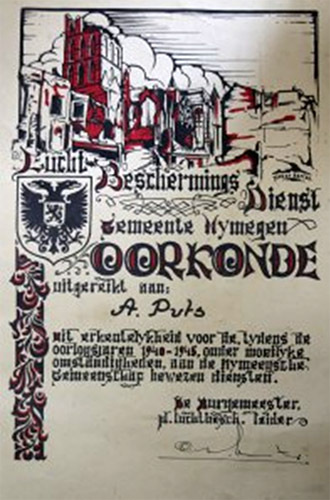 Nijmegen had an 8.00pm curfew and most people had to be off the streets by this time but I was a member of the church boy’s choir and had a Special Permission Pass to be out on the public streets until 21.30 hour but only on Tuesdays and Thursdays. 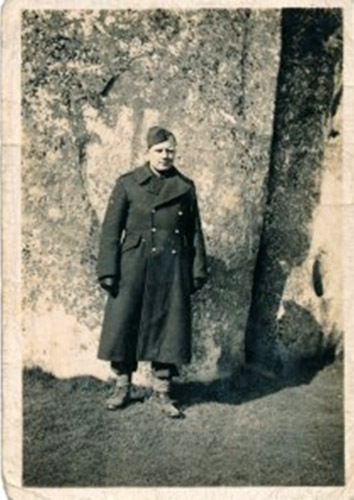 Some times I was stopped by German soldiers and they would ask, “Auswisse Bitte”, so I would show them my pass and then they would tell me to go home “Snel, Snel”. In the last years of the war my cousin, Henk Vrolijks and I bred several Belgian hares for food and to sell the skins. My Aunt Lies used to kill them. The only thing we hated about keeping the rabbits was when we had to search for grass to feed them. As we lived in a city and there was no grass nearby we had to travel into the country side. So every Wednesday and Saturday it was our job to go into the country to collect grass or any old scraps of food for the rabbits. Our best and in fact only way to find grass was around the Maas-Waal canal which was about ten kilometers from home. We used to ride a bicycle but one day it was confiscated by a German soldier. It was our one and only bike so a very good friend gave us a ladies bike but it had no tyres. The 22nd of February, 1944 was a very black day for our beautiful and historic city. 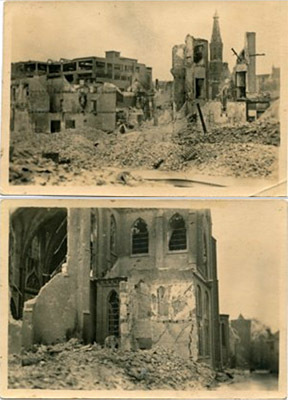 At about half past one in the afternoon, Nijmegen was heavily bombed by the American 8th Army Air Force. Never in her 2,000 year old history had the city been as greatly damaged as it had on that day when practically the whole of the inner city was transformed into ruins within a very few moments. A total of 771 people died in this bombardment and the resultant fires took until noon the next day to bring under control. 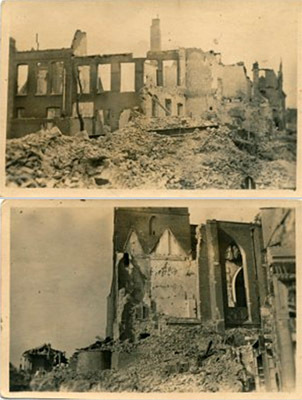 Massive damage was done and about 1,200 buildings were either destroyed or badly damaged. 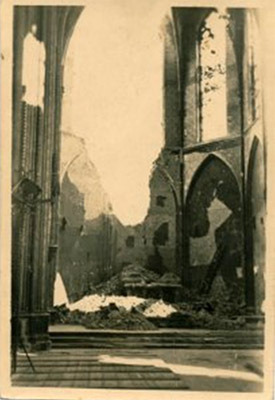 The bombing was the result of an unfortunate mistake caused by poor navigation and it’s possible they may have thought they were over the German city of Kleve which is twenty kilometers to the east. I lost a cousin on that terrible day. He had the same name as me but was two years younger than me and was the grandson of my grandfather’s brother. It was a very sad time for me but life went on and it allowed us to gather more wood to make more hutches for the rabbits. The timber came from various bomb sites, but mainly from the bombed hotels across from the railway station. On the 15th and 16th of September, 1944 the German army was withdrawing from the south and moving through Nijmegen. Around the corner from us was the Graafseweg highway and along this road there was good tree cover except between the two bridges where the road crossed the railway lines. It was open ground along this part of the highway and I can remember allied fighter planes using this bare section of road to strafe the retreating German troops. The next day 17th of September Operation Market Garden began. Market Garden was an allied military operation in the Netherlands using large scale airborne landings and its tactical objectives were to secure a series of bridges over the main rivers in the area. The strategic purpose was to allow the allies army’s to cross over the Rivers Maas, Waal and the Rhine at Arhnem. 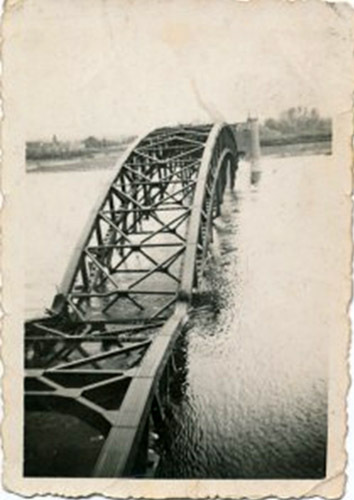 The operation was initially successful with most of the bridges captured but was a failure overall since the planned Allied advance across the Rhine at Arhnem had to be abandoned. The British 1st Airborne Division did not secure the bridge at Arhnem and the Rhine remained a barrier until the offensives at Remagen in March, 1945. As a result the north of the Netherlands could not be liberated before the winter set in and the hunger and cold took a lot of lives. Nijmegen was at that time in the front lines for six months and we lived in a bomb shelter at home for most of them. My mother wanted to go to the large shelter at a local factory that I’ve always thought of as the Kapok factory but dad was against the idea. I can no longer recall the company name but remember that they made mattress and pillow stuffing from seed pod fibers taken from the Kapok tree. My father refused to go there saying, “No way! That shelter is far too big”. We did know a lot of people who went to that shelter including some boys I attended school with, the sons of a man if I recall correctly was named Albert Smit. 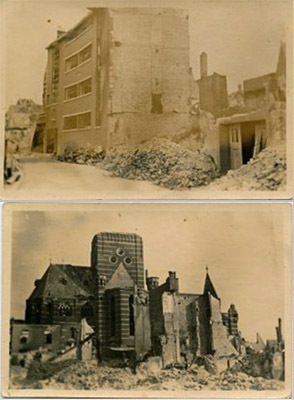 However we were lucky as on the 2nd of October 1944 a bomb fell on the factory and I think 87 people died that day. Nijmegen was subjected to German gunfire and shelling for six months (Oct to March) with the last shell exploding in late March 1945. 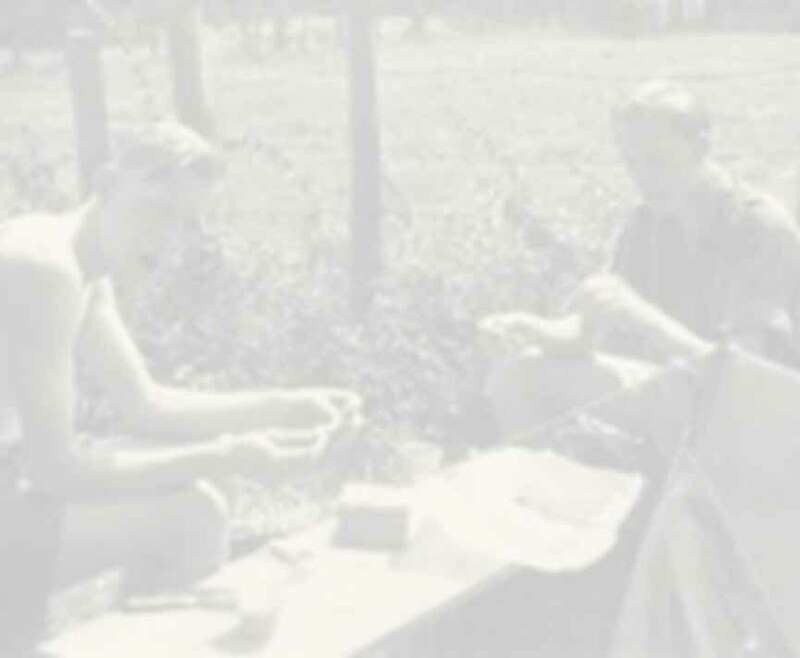 Auntie Lies and my cousins came to stay with us at this time because Uncle Wim was still a prisoner in Buchenwald concentration camp and things got pretty crowded. 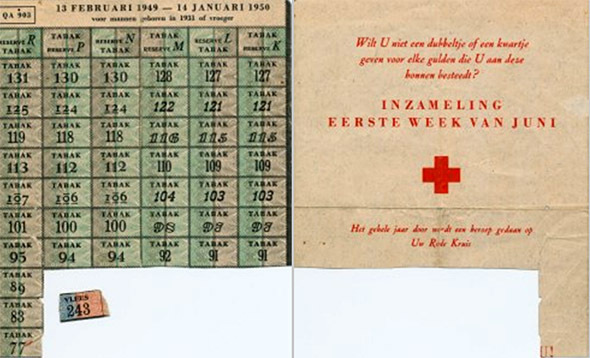 Six months crammed into a bomb shelter with my parents, brothers, sisters, Aunt and cousins sometimes became intolerable and whenever there was a lull in the fighting and things got a bit quieter my cousin Henk Vrolijks and I would escape the shelter and have a look around. The sad account at the end of this time was 2,200 dead and 10,000 injured. Also during those six months my father joined the Luchtbescherming (Civil air defense) and so because of his duties dad was not always home. 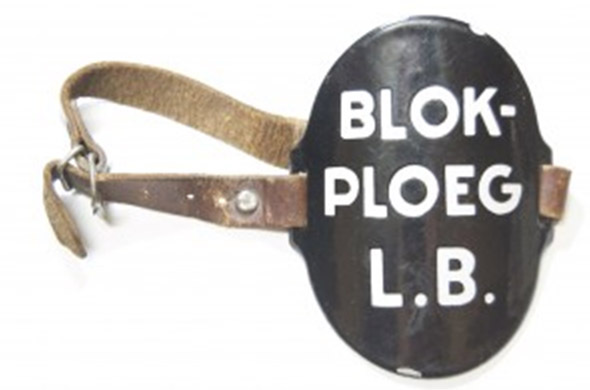 I still have the black enamel arm band he was issued with, with the words Blok-Ploeg L.B in white lettering written on it. He also received a certificate from the Burgemeester of Nijmegen, PL, Luchtbescherming Leider in recognition of his service. 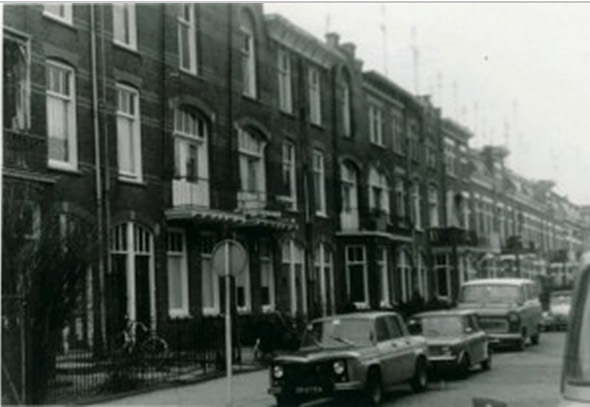 As the fighting moved out of the city and the situation became safer we would often go to the corner of our street Graafsedwaarsstraat and the highway Graafseweg. Here my cousin and I would stand around and watch as there were often allied troop convoys going by and sometimes the soldiers would ask us, “Have you got a big sister? We have stockings, we have chocolate”. I can also recall at this time the amazement I felt on seeing the scores of ammunition boxes and crates of other supplies stored on the sides of the roads waiting to be transported to the allied troops up at the front. We had soldiers billeted in our home from time to time as the allies moved up and the front lines began to enter Germany. They used the ground floor of our house and first we had English soldiers stay, then Canadian soldiers and then English soldiers again. We were also peeling potatoes for a Canadian cook who was stationed nearby for a time and I remember his name was Roy. Slowly the war began to pass us by and things were returning to some normality. We would go down to the railway station sometimes and help the men who came back from Germany with their belongings. If they had any that is! We would load their belongings onto our little billy cart and then bring them to where the busses waited to take them to their home towns. My Uncle Wim Vrolijks came home from Germany and so did one other uncle. Uncle Theo Van Steen also came home along with his wife. Uncle Theo had been in the Dutch Colonial Army during the war and while serving in the East Indies had been captured by the Japanese Army and interned in Changi prison. One day a transport train came and stopped at some burnt out storage sheds near the railway station and it was full of tents. We were told that they were going to burn the lot but before they could do so we managed to rescue two small pup tents. And so the end of the war came. Life began to slowly return to normal but it was not always easy. There were many shortages and essentials like bread and tobacco were still only available on coupons of which I still have a few examples of the tobacco coupons. Sometime in late 1945 I broke my hip and so off I went to hospital where the doctor put a metal pin in my hip however by 1946 I was fit enough to start trade school (Ambachtschool) to learn to be a painter and decorator. As hard as things were we would still take time for holidays and I still have fond memories of camping with my friends in our rescued ex-army tents. In 1949 I was one among many called up to do National Army Service. The Army doctor that examined me asked about the scar on my leg and I replied, “I have a pin in my hip” and so was excused National Service. Then one day in 1952 my father came home from work and told us that he had applied to emigrate from the Netherlands to Australia. So it was on Wednesday the 2nd of April that our family left to start a new life in Australia. Leaving from Amsterdam through the North Sea we stood on deck as night fell and watched the Dutch coast disappear from sight. Off we went to our new country, through the Panama Canal, on to Tahiti and then New Zealand. On the 12th of May 1952, after six weeks at sea we eventually arrived in Sydney and then on the 14th of May we finally landed at Station Pier in Melbourne. Dad had a sister living in country Victoria, in a town called Shepparton which is approximately 180 kilometres north of Melbourne and this town was to be our new home. I can recall sitting in the train, beginning our journey to Shepparton, we were traveling through the suburbs of Melbourne and gazing out the window at the passing houses. Dad turned and said, “There’s a lot painting to be done here! Have a look at them rusty roofs!” We lived and worked in Shepparton for several years and in 1956 while still living in Shepparton I married an Australian girl named Helena Watts although she preferred to be known by her middle name which was Joyce. We had three children together, two boys Greg and Mark and a daughter Andrea. 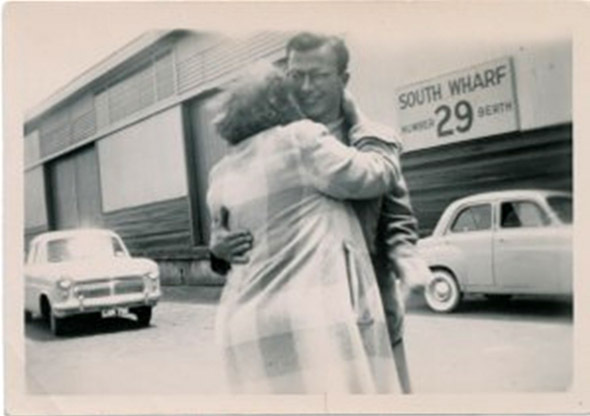 My cousin Henk Vroljks followed us to Australia and he is seen in this picture hugging Oma. We all came to Melbourne in 1958, my parents, siblings and my own growing family and settled in a suburb called Dandenong. In the year of 1961 Dad and I started our own business called A.J. Puts & Son and I’m proud to say that the business is still going, with our second son taking over after my retirement. My wife Joyce died on the 2nd of May 2004 and the following few years were very dark until on the 18th of February 2006 I was married to Caterina Johanna Suidgeest. Now here I sit retired, sorting through this little box of mementos, recounting memories of my youth in the Netherlands and my early days here in Australia and although there are too many memories of my life here in Australia to recount in these pages I would like to briefly touch on some of the things I’ve been doing in recent years. To keep busy I began to fill up my time volunteering for various events such as the 2002 World Masters Golf Tournament, helping Arthritis Victoria in 2003 and doing volunteer work for the 2004 Blind Golfers Tournament, the Deaflympics in 2005 and the Eighteenth Commonwealth Games in 2006. It’s with great fondness that I recall the memories of my life here in this country that I now call home. Working, raising a family and enjoying life, but that I’m sorry to say is a story for another day. Redactie, 09-07-2011: wij kregen vandaag bericht dat Henk Puts op 26 mei is overleden, 80 jaar oud.